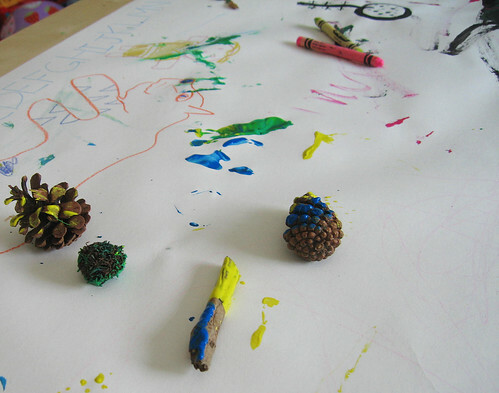 Some pinecones, a stick, and a spiky seed pod that my limited botanical skills cannot identify. Lara wasn't so much into the actual painting process, but she was totally thrilled to give a pinecone to Misha as a present when he came home at night, and to put another one up on her art shelf. We'll try again soon. My son is not in to crafts or art and it kills me. I have tried everything. Still, I won't give up! I will find something he likes! Keep trying! Your post today reminds me of a book and blog that connect directly to what you've been thinking about. The Creative Family is an amazing book, written by Amanda Soule. I can't say enough about this inspiring woman...Just check out her blog and enjoy. What a great idea to start with coloring real objects. I wish we did it when you were little. And I really liked the opened golden acorn - it looks very pretty.